For the past few years, the city of Toronto, in its quest towards greater globalization, has made a great leap forward with architectural icons, related to the signature of their designers. However widely publicized, this type of architecture has its limits. There is, nevertheless, another side to the city of Toronto, fulfilling the need to constantly counter the adverse effects of urban renewal and to give meaning to citizens' living spaces. By its nature and architectural program, the St. Lawrence Market competition is in this line of thought: its goal being to reflect upon the civil sense of architecture. The competition's site is blessed with a rich history. It is located in one of Toronto's most interesting heritage sites that have managed to survive the central district's urban transformation. The St. James Anglican cathedral (Cumberland et Ridout, 1853; Langley, 1871-1874) dominates the sector. It is faced by a series of modest buildings, which constitutes, with a few other remnants, a traditional urban structure based on street space. Moreover, among these buildings the Army and Navy warehouse store was given an exemplary renovation by architects Kuwabara Payne McKenna and Blumberg, who had made apparent the potential located within these heritage buildings. However, among all these buildings, the St. Lawrence Hall and its associated market make up the competition's anchorage. Since the nineteenth century knew how to imbue institutional architecture with realities of a new democratic era, markets located in the heart of daily life were often associated with entertaining community events (dance or concert hall, for example) and at times, administrative functions (municipal or governmental). The most widely used solution was to move these activities to floors above the markets themselves. In comparison, for the St. Lawrence Hall (1849-1850), William Thomas chose instead to divide the building into two sections, with a hierarchy clearly noticeable by their relationship: the Hall in front, located along King Street and the market in back. Taking the form of a compact structure, the ornamented Hall is clearly one of Thomas' and is now one of the finest examples of neoclassical architecture in Canada. This generally explains the development of the market's activities (northern market) in a typical building that has been demolished and replaced with a modern building lacking fullness. This initial axial development logic, centered on the hall, was pursued with the vast hall south of Front Street (southern market). Since market activities are always held on site, one of the competition's challenges was not to only maintain these activities, but reinforce them. Considering this idea, the decision to link the market to a provincial courthouse and administrative offices is interesting since it blends with the initial topology of public markets in Canada. The jury's comments were not submitted to the CCC. This is always an unfortunate situation, as in all design processes and especially in competitions, there is never a unique solution. Each participant contributes to the project's development, and beyond their final decision, the jury is an integral part of this process. Given the quality of the five projects, the jury's report would have provided valuable insight. Nevertheless, without its judgment, the ideas behind the various projects are interesting historically, and regarding the location and sector. Concerning the markets topology, three out of five projects have increased the stacking effect above the markets by treating the walls and ceilings. Their design varies between imitating the forms of the southern market and the desire to design an iconic and sculptural creation. In fact, these three projects contrast with their environment, which would be their strength if chosen. A fourth project confronts a cubic structure on the Front side by a series of steps acting as levels behind the St. Lawrence Hall, seeking dynamic relationships with the surrounding environment. In comparison, the winning project by Adamson Associates and Rogers Stirk Harbour + Partners has the simplest volumetric construction. The plan follows a strict direction in design, divided into two wings on either side of a central axis, providing interior views of the St. Lawrence Hall. The process is ingenious. The project's context becomes a reference to the interior's organisation. In addition, this plan upholds the traditional composition originally found on the site, something no other participants had developed with such stringency. Thus, the solution highlights plainly the historical building. In many ways, we can also see within this plan the conventional shape of shopping centers, like Toronto's Eaton Center, which we can learn from even to this day. Like the Eaton Center, the architects decided to use an abundance of glass. Following the logic of the alcove and of the room that governed Nineteenth Century architecture, justice is partly staged within the interior mall, yet outside also. Its extroverted character contrasts with the other projects' introversion. However, like these projects, the ground floor is given fluidity into urban spaces and it is done so for the benefit of all surrounding streets and for the green space that runs along the western building. Beneath its apparent simplicity, the project involves an appropriate, well thought out and convincing clarity. Instead of amplifying the sector's contrast, which still includes a few historical traits, its spirit and form are renewed. The project not only gives purpose to the civil architecture demanded by the architectural program but it does so with amenity towards the city. 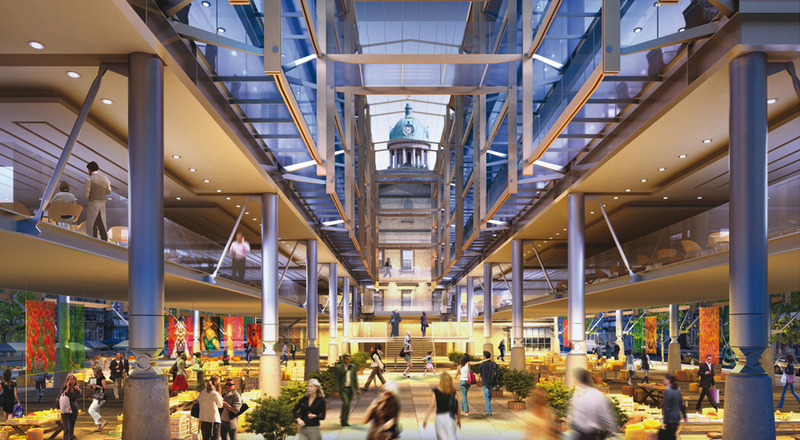 The City of Toronto (the City) invites Architects to submit their Expression of Interests (Stage I) to participate in a Limited Design Competition (Stage II) for the redevelopment of a prominent public property located in the St. Lawrence Market Complex at the core of the City's historic St. Lawrence neighbourhood. The St. Lawrence Market Complex consists of three buildings: St. Lawrence Hall, the South Market and the North Market. St. Lawrence Hall and the South Market are both significant heritage assets to be retained, while the North Market Building requires redevelopment. Although the North Market Building houses the successful Saturday Farmers' Market and the Sunday Antique Market, it was built in the late 1960s without the view to longevity or heritage sensitivity, has declined in public utility and is in a form incongruous to its historic neighbours. The City's redevelopment strategy is to replace the existing one storey North Market building with a new multi-storey, multi-purpose building (of approximately 11,237 square metres above grade) that will house the established Saturday Farmers' Market and Sunday Antique Market, as well as Toronto Court Services' court rooms (for offences under the Provincial Offences Act) and administrative offices on the upper floors, and a 250-space underground parking garage. The City has selected a Limited Design Competition (the Competition) process to deliver the design of this project. The Competition presents Architects with the opportunity to create a new North Market building that has relevance for the future, is sustainable and energy efficient, and expresses its function as a place to be. A public market has existed in one form or another on the North Market site since 1803 and will continue to do so well into the twenty - first century. The challenge of how to combine the long-standing civic function of a public market with an expanded role that reflects the diverse and multi-faceted needs of the City - in a building that is still capable of representing the history of the area - is unique and exciting. The City is confident that the design community can add architectural excellence to the St. Lawrence neighbourhood, and create an appropriate and respectful building on a site that is considered to be the birthplace of the city.